A hangnail is one of the most common problems associated with nails and can affect a person of any age and gender. Read and know all about this condition, including its causes, symptoms, diagnosis and treatment. The term “Hangnail” refers to small skin strips that detach from the cuticle, or the skin surrounding the nail. In people affected by this condition, the cuticle gets so dry that small splits or tears can be noticed in the nail plate. The condition typically arises when the cuticle gets extremely dry or cracked and partially separates from the nail region. It may also occur if an individual pulls or picks the area. In children, nail biting is a common cause of this disorder. This explains why the condition is observed more in children than adults. However, the problem can also affect adults in whom the habit is persistent even in the grown up years. Excessive swimming in chlorinated water of swimming pools during the summer months may also lead to this ailment. Chorine and sun tends to make the nails brittle. Soaking the fingers for a long time in water (while washing clothes or dishes) can weaken the nails and cuticles. Gardening and similar activities can make the hands rough and dry, making nails and cuticles crack. These can also lead to this condition. It is typically characterized by a torn, small piece of skin next to a toenail or fingernail. Hangnails can cause much pain if they are caught on ends of clothing or anything that is being touched. However, these are more an unattractive problem than a physiologically serious one. 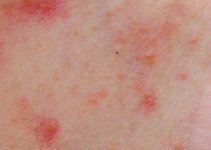 They are cosmetically unpleasant which makes many people want to get rid of them as soon as possible. However, a prolonged lack of treatment and proper care may aggravate the problem and lead to an infection of the region. Infected hangnails can be quite painful. The problem is typically diagnosed by physical observation of the area. The damaged region is carefully observed to check the nature and extent of the problem. In case of an infection, a biopsy of the skin region may be considered. The differential diagnosis of hangnail involves distinguishing it from ingrown nails, a condition that it is often confused with. Ingrown nail is a condition in which the corner of a particular nail grows inwards into the soft skin of the nail bed. This is unlike hangnails, which are soft skin flaps that tend to separate from the cuticle. The problem is treated with the aid of medications as well as home remedies. In case of fungal infections, use Funginix, Zetaclear and other natural oils that help heal the affected region. Petroleum jelly or lip balm may also be regularly used to prevent this problem. Antibiotics can be used to cure cases of bacterial infection. Usually, home remedies are enough to tackle this problem. Medical treatment is only required to cure cases where hangnails get infected. In serious cases, doctors may recommend use of antibacterial lotions along with prescription antibiotics. Soak the affected finger for a few minutes in warm water. Next, use cuticle scissors to clip the hangnail. Once clipping is done, massage some amount of lotion into the nail bed. Continue the process a few times every day until the region heals. In case of a severe damage, cover the area with a bandage until it heals completely. People with hangnails are often recommended to remove them only after soaking their affected finger for about five minutes in warm water. This makes the skin soft and easy to cut. Cutting a dry strip may often lead to a tearing of the skin, which may result in more hangnails. If the area suffers from a bacterial infection, pour a few drops of antibacterial lotion over the nail bed and gently massage the region. This is one of the most trusted infected hangnail remedies. Do this twice every day for a week or until the infection subsides. Doctors typically suggest using a bandage to wrap the region that has been applied with antibacterial lotion. Regularly massaging the finger skins with olive oil or bath oil can keep them moist. Oil massage can cure as well as prevent the occurrence of this problem. Following a proper diet can also help you cure as well as avoid this problem. Your daily diet should consist of dairy products, seafood, soy and celery which contain nutrients like iron, potassium, Vitamin B and calcium. Nails require these nutrients as well as the right care for proper growth and nourishment. A right diet can keep your cuticles and nails healthy and prevent development of this discomforting condition. Drink at least 8 glasses of water every day. This will help you avoid dehydration and prevent splitting or weakening of your nails. The body needs enough water to stay healthy. The nails and cuticles, which are parts of the body, are no exception. As already said, prolonged bathing in chlorinated water during the summer months can make your nails brittle. Use a sunscreen on your hands and apply moisturizer to the fingers, especially the region around the nail beds, after a swimming session. There are people who are not nail biters and yet, suffer from this condition. In such cases, the problem is mainly attributed to dryness of skin. Medical experts advise such people to use a good hand lotion, preferably twice a day, to reduce drying of the cuticles. Some experts also recommend soaking the hands daily in a solution of oil and water for approximately 15 minutes. It is essential to moisturize the fingertips before doing anything on the nails, such as pushing down the cuticles. Moisturizing can help prevent getting hangnails. If trimmed properly, the condition may go away within a few days. Paronychia is a common infection of the soft skin around the nails. It usually arises due to biting fingernails or picking or pulling a hangnail. It is a common complication of Hangnail and usually occurs in children who have a habit o sucking their fingers. 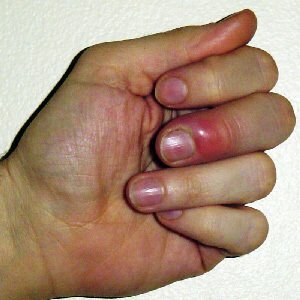 Based on the time period of presence of the infection, Paronychia is classified into two types – acute and chronic. Both types of Paronychia develop due to a break in the skin around the nail bed. Perfumed lotions with alcohol base often make the nails dry. Stop using such a liquid preparation to be on the safe side. You may use special oils available in the market to keep your cuticles hydrated and let them stay attached to the nail. Regular manicure sessions can also help keep this problem at bay. 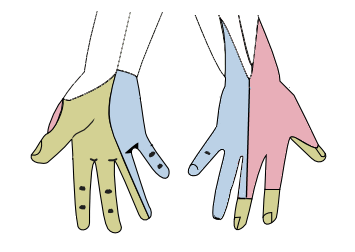 During manicures, hands are typically soaked in an oil solution. This helps soften the skin of the fingers and makes it easy for manicurists to remove discomforting hangnails. If you find a piece of skin sticking out of the region surrounding you nail, trim it away with sterile manicure scissors. Trimming involves a mild possibility of infection. However, hangnails may also suffer from infection I they are pulled or picked on. This can easily occur if they get caught in clothing, which may end up ripping them open. The more a skin flap is pulled back or played with, the higher the chances for it to get inflamed or suffer from an infection. A hangnail that is filled with pus, or appears very red, is most likely to be infected. Such an infection can spread beneath the nail and damage it. Naturally, it is a good idea to visit a doctor if you sense a hangnail infection. Monitor the region carefully to check for inflammation, redness or any signs of infection. Consult your doctor if you spot any of these problems. Prevention is the best treatment for hangnail infection. It is recommended that you use a pair of scissors dipped in alcohol before trimming the cuticle. Doing this minimizes the chances of infection. You should also apply a little antibiotic cream to the hangnail and wrap the area with a protective bandage. A hangnail should always be trimmed with a pair of sharp, clean scissors. The skin should not be pulled or bitten off as the region may suffer a tear, which can further aggravate the problem instead of curing it. Dip your affected finger into a cup of hot water as you watch television or have a chat. Warm water helps keep the infected cuticle clean and reduce redness and inflammation. Infection generally subsides two to three days after the beginning of warm water treatment. Remember not to heat up the water too much as you may end up burning your finger and further adding to your discomfort. Visit a doctor if warm water soaks fail to improve the condition and you are suffering from fever and a worsening infection. Physicians typically administer antibiotics which take a few days to cure infection completely. 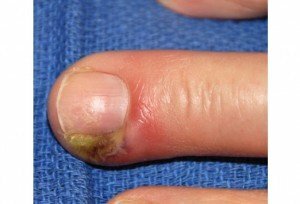 Check out these hangnail infection pictures to know how an infected finger with hangnail looks like. 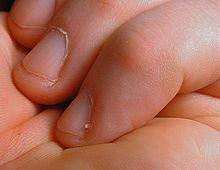 Hangnails can not only arise on fingers but also on the toes. Little skin flaps on the toes can cause extreme discomfort while wearing/removing socks or shoes and also during other activities, such as walking and running. The treatment of hangnails on toes is nearly the same as done for those on fingers. Dip a cotton ball into a little bowl containing rubbing alcohol. Soak it thoroughly and use it to wipe the blades of a sharp nail scissor. Alcohol disinfects scissor blades and reduces chances of an infection after you use them to trim the detached skin flap over your toe. Next, soak your affected toe into warm water for about 5-10 minutes. This would help soften the skin flap and ensure its easy removal. Lift the toe and rest it on a surface before you. Allow it to dry for a few minutes. Gently lift the skin flap and snip it at its base. Try to cut quickly and in as clean a manner as possible. This would help you avoid tugging or pulling on the skin. Soak another cotton ball into rubbing alcohol. Gently wipe it over the operated area to clean it. This would minimize possibilities of an infection. Massage a moisturizer into the operated region to soften it and prevent development of more hangnails. Wrap the area with a bandage to keep it clean and protected from germs. Even the most carefully groomed fingers and toes can be affected with hangnails. Fortunately, this is a minor condition that can go away in a few days with proper care and treatment. Even cases of infection tend to resolve with proper medical treatment. However, long-term avoidance of this problem solely depends on you. With the right care and proper diet, you can easily prevent getting this condition and safeguard your nails from all discomforts. My finger has been affected by the hangnail and I am supposed to write my supplementary examination this Friday but I can’t write because my finger is painfu,so I don’t know what to do ..